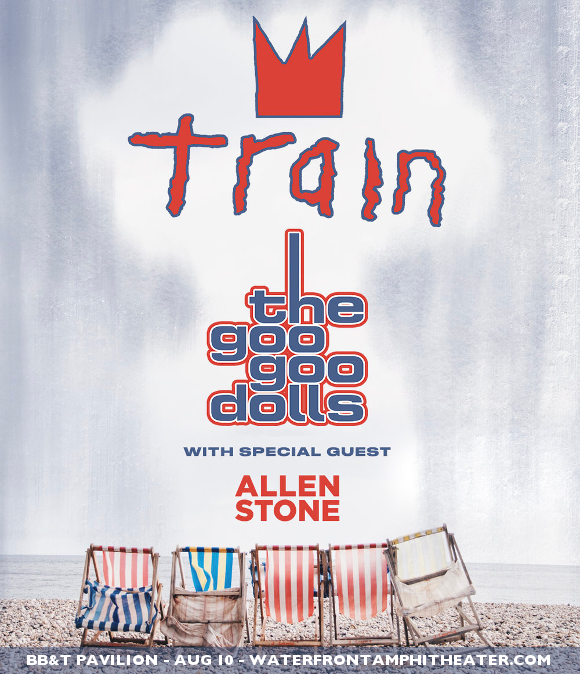 Train fans, get ready for an exciting announcement!! The band who brought you hits such as “Meet Virginia,” and “Soul Sister,” have announced they’ll be touring with the Goo Goo Dolls and Allen Stone in 2019!! The North American tour comes to BB&T Pavilion on Saturday 10th August 2019 – be there! Tickets on sale NOW! Consisting of band members Patrick Monahan, Hector Maldonado, Jerry Becker, Drew Shoals, Luis Maldonado, Nikita Houston and Sakai Smith, Train are a diverse rock group with a sound that’s been evolving steadily ever since their debut self-titled album of 1998. A further nine albums later, Train are now touring in support of their brand new greatest hits compilation album. In addition to all the best-loved fan favorites, the album will include the band’s cover of George Michael’s “Careless Whisper,” featuring saxophone by Kenny G! As for the Goo Goo Dolls, they’ll have just finished touring in 2018 in celebration of no less than two decades since the release of their incredible album “Dizzy Up The Girl,” featuring the astonishing hit song “Iris,” which remains to this day one of the best-selling crossover songs in popular music history. The band are currently working on their 12th studio album, with the “You Should Be Happy,” EP of 2017 and “Boxes,” album in 2016 ensuring fans still have something to get their teeth into while they wait. Listen to Train’s cover of “Careless Whisper,” below – but don’t wait about too long to get tickets, they won’t last! !